Lausanne, Switzerland, February 1, 2016 – The FIVB Sports Events Council reviewed a successful 2015 edition of the World League on the first day of its two day meeting at the FIVB headquarters in Lausanne, Switzerland on Monday. The Council, which meets annually, reflected on a number of firsts including France winning the annual men's competition for the first time while Egypt gained promotion to Group 2 after winning Group 3 for the first time. The World League, which was in its 26th edition last year, saw an historic 32 teams participate in 2015, featuring 423 players and 29 host cities. New hosts included Montenegro and Kazakhstan while Greece and Egypt returned after several years away. There were a total of 691,947 spectators over 174 matches at an average of 3,977 spectators per match. Major achievements included use of the Challenge System and Referee Communication Sets in all Group 1 matches for the first time. Group 1 saw an overall increase in spectator numbers compared to 2014 with USA and Serbia especially seeing significant increases. France also became the first team in World League history to win Group 2 and then go on to win Group 1. 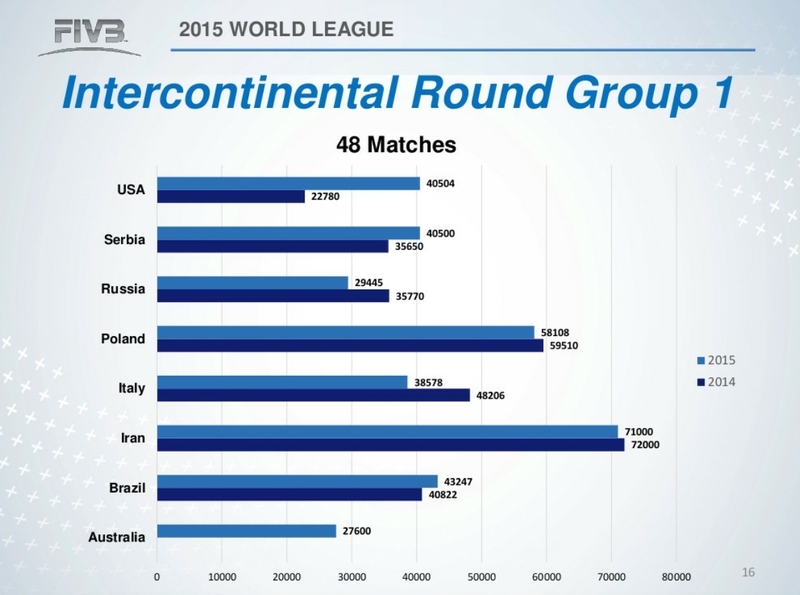 World League 2016 will include the same innovations but with a record 36 teams. The competition will feature the World Grand Prix format for the first time with teams playing in a round robin format before the Finals take place in city TBC, Poland, (Group 1), Porto, Portugal (Group 2) and city TBC, Germany (Group 3).